Saxon Global is emerging as one of the trusted Business Intelligence, Mobility, Big Data and Cloud services vendor that can help organizations to derive business insights for better decision making. Saxon Global is a valuable partner that you can count on for very fast response times and great customer service to go along with it. They have helped me to expand my business by identifying relevant and quality candidates, even in the toughest skillsets. It has been a pleasure developing a relationship with Saxon Global through a mutual respect for hard work and success. I am grateful for the assistance that Rahul Chaudhary and Saxon Global has provided us. From their attention to detail and transparent communication, to their ability to respond quickly with quality candidates, they have become an invaluable partner to my business. Saxon Global is my go to organization when I’m searching for 3rd party staffing options. They are uniquely qualified to provide highly technical talent at fair and competitive rates. Saxon Global also responds to my company’s staffing requests in a very timely and effective manner. We look forward to continuing our partnership with them for many years to come. How is Saxon different from other IT staffing firms? We never stop learning and improving. Our recruiters participate in mandatory technology training provided by in-house technology guest speakers. We also remain active in the technology community by attending tech meetups and sponsoring tech education events. As we increase the technical savviness of the recruitment staff, our service level increases for our clientele. WHAT TYPES OF POSITIONS DO YOU FILL? What kind of fees are involved for your staffing/recruiting services? We assist with contract, contract-to-hire, and full-time hire positions. For contract positions, we work with our clients to help them decide the type of consultants who will be appropriate for the projects and within their budgets. We will propose a final rate when we present candidates for projects. This bill rate will cover the employee W2 wages, federal taxes for the employee, workers’ compensation, FUTA, SUTA, payroll processing, and Saxon service fees. For full-time hires, we will charge a percentage of the first-year salary of the placed consultant. Our fees range depending on the volume of hires by a client, however our standard fee is 20%. For example, if we place a software engineer with a base salary of $100,000 with your firm, we will bill you $20,000 on the day the candidate starts. We will set terms for the guarantee period outlining rebates if the candidate does not stay in the position. WHAT IS THE LEAD TIME WHEN REQUESTING TALENT FOR A SPECIFIC PROJECT? Once we have spoken with the hiring manager for the position, our team will immediately go into action. Our team will provide two qualified resumes for the position within the first 48 hours. How do you ensure quality of the resources/talent you provide? Our recruitment staff consistently focuses on all positions needing to be filled. This builds their capabilities in interviewing and screening candidates for particular skillsets. Our recruiting teams are divided into specific technology disciplines to insure this high quality of screening is accomplished. We compliment this method with consistent reference checks, giving you confidence in the candidate options we bring to you. What different services does your firm offer? Our firm also payroll serving for pass through candidates. We have a sound healthcare benefits plan for our consultants that make working through Saxon a comfortable and rewarding experience. I am glad to work with Saxon Global as it is an experienced organization and capable of handling all the necessary aspects of the recruitment process. The company's professional approach, timely guidance, training and support helped me a lot in finding projects. I would also like to thank the recruiting managers for helping me find projects all over USA. Timely pay and good benefits impressed me a lot. I worked for Saxon Global for more than 3 years (2013 to 2016). All the staff were very knowledgeable and helpful resolving any queries I had. Any questions or issues about visa or green card were promptly handled and answered by Saxon Global and their attorneys. Payments were fast and hassle free. Overall, I had a very good experience working for them. It’s been around ten years that I have been working for Saxon Global. It has proved to be a good experience for me. I have been able to develop myself both ‘personally and professionally’. The staff and recruiters are always ready to provide their support. The company also provides various trainings to all employees, which have been of great help in grooming and development. I am treated professionally at all times. It is a very positive environment around where I have been given the opportunity to learn and work on a wide range of projects. Saxon Global is known for its focus and knows exactly what goals need to be achieved. The organization focuses on bringing out the best in an employee by creating a drive that is fueled by the willingness to contribute and win. It truly brings about a winning culture. Gopi Kandukuri, our CEO has been very supportive towards developing employee’s skills with adequate mentoring. Overall, it has been an enriching and exhilarating experience. Saxon Global Inc. gave me an opportunity to succeed in my career. HR Department is effective and efficient in handling employee issues. Thanks Gopi for your support. It has been a pleasure working with Saxon Global. As a consulting firm, it has helped me achieve my goals and has also provided great opportunities to develop my technical and leadership skills." Working for Saxon is and has been a great experience for me. We have an awesome culture here that keeps things fun and at the same time everyone knows clearly what their roles and responsibilities are. The culture of the company is consistent across it's different locations which is a key to our success. You visit our office in Dallas and you visit our office in Hyderabad, I bet you won't feel the difference. Our CEO is a constant source of encouragement and he is accessible whenever we need him and he really truly cares for his employees. Come join us, Saxon provides an environment where you will not just grow but thrive! "Saxon Global is a great consulting firm to work for. CEO, recruiters and all staffs are very friendly and always ready to help you. This company works directly with clients and have many diverse projects that you can work on. Working on diverse projects will help you diversify your knowledge and experience. Pay and benefits are great. I highly recommend this company for whoever wants to work on challenging and rewarding projects." When it comes to IT Consulting there are many companies that talk a good game, but Saxon global help you make it happen. They have enabled me, trained me and have given me the confidence to use my IT skills in the US market. Flexibility and easy to deal with policies are its key strengths. It’s engaging staff, immigration lawyers and multitude of clients are bringing forth great results to my career. I joined Saxon Global right after college as a Business Systems analyst and have been working with them ever since. When I first joined, Saxon helped me a lot through on hands on training which polished me into the analyst that I am today. Saxon's industry knowledge and their relationship with top tier clients is parallel to none which makes them unique and a very sought-after company to work with. "Saxon Global is definitely an outstanding player bridging the gap between clients and consultants by staffing the right people on right projects across the country. The company has great and highly committed sales and marketing team, I had an awesome experience working with Laura (on marketing team), she is expert in the whole staffing life cycle (screening, interview process, on boarding, client relationships etc.)" "I've been working at Saxon Global for 2 years now. Throughout my status as an Saxon Global employee Saxon has been really instrumental in not only helping me start my career, but helping me sustain it. The staff in all functions have been incredibly helpful in supporting me throughout, in terms of training, job opportunities, affordable health insurance, on-time payment of salary, and anything else that I have expressed to them that I need. So all in all, Saxon Global has been an awesome employer!" I am with Saxon Global for more than three years now. It has been an exciting journey. It's a top-notch place to work with amazing people around. The experience I gained in Saxon is invaluable. I was able to work in some of the best clients in its domain due to Saxon's continuous commitment towards quality and professionalism. I would like to congratulate and thank Gopi and the team for being amazing at their job. Keep it up." After completing my Masters, I was lucky enough to be recruited by Saxon Global as a Business Intelligence Developer. Having little experience under my belt, Saxon gave me all-around training which helped my skills remain up to date in the ever-changing world of Business Intelligence. Furthermore, with their knowledge of the IT industry and a great credibility with clients, they placed me right away for a project which I have been a part of for over a year now. Saxon Global Inc. has given me a lot of growth opportunities and takes a great care of consultants. 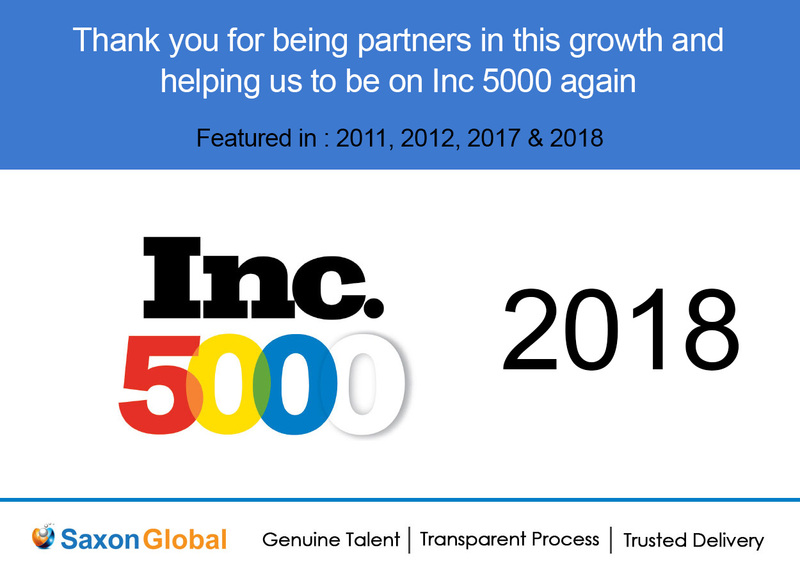 I was very impressed with the people I met/talk during the interview process, and my respect for the Saxon Global Inc. team has increased over time. All the staff at Saxon Global Inc. works hard to provide the best possible services to the consultants and always ready to help consultants. Right from the beginning, all the processes were very transparent and Saxon Global Inc. made sure I knew everything I needed to. Sure. I loved the quick turnaround from profile submission to getting the offer in hand & also it was great working with you on the Freddie Mac assignment. Would love to work With Saxon again in the future.